Where has the year gone, Woolfest 2018 is only 3 weeks away, Woolfest 2017 was the event that I launched the Hawkshaw Sheep yarn business. 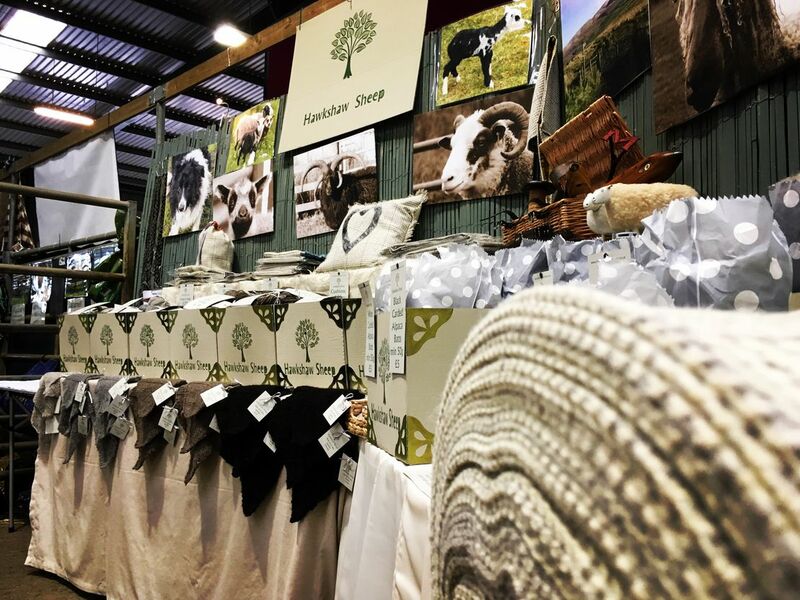 What a year it has been for the business, when I rocked up for Woolfest last year, after getting the sheep settled, I set to getting my stand set up, being the first time I had ever had to do this, it took me almost 6 hours!!! with still some bits needing done first thing the next morning. That first event was a huge huge learning curve, firstly setting up, then when the customers started to arrive, I found it incredibly difficult to approach them to tell them about my lovely yarns and the provenance behind them, I did get better at this as the day wore on and the next day was definitely easier. Taking the stand down, I had intended to put everything away neatly and in its proper place, the reality was somewhat different, everything just got chucked into the nearest available box and packed into my trailer as quickly as possible, so I could start the long drive home. Well 2017 has been and gone, and here at Hawkshaw Sheep HQ, what a year it has been, mostly ups a few downs and as usual controlled by the weather! Jan - The 2016 clip of the Hawkshaw Sheep fleeces arrived back in the from of yarn, the start of my new business. Sent in an application for Woolfest which if accepted is where I will be launching my Hawkshaw Sheep business. I took my weaving yarn over to Andrew Elliott the weavers in selkirk to have a length of Tweed cloth produced. Feb - This month was taken up with twisting the hanks of yarn into skeins then making and attaching the labels. Heard that my application for Woolfest had been accepted. Got my Tweed cloth back from the weaver, it far exceeded my expectations, it is gorgeous. Well here we are with September almost at an end, and I still have fleeces to sort ready to send to the scourers. It has been a very busy month, here at Hawkshaw Sheep HQ. We started by gathering the sheep in off the hill to start weaning the lambs from their Mothers, it makes for a noisy couple of days after we have split them up, but both the lambs and their Mothers soon get used to the idea. Next it was time to pack up the van and head off to the Perth festival of yarn, as Perth is only a two hour drive from home I travelled up early that morning, I arrived in plenty of time and had to wait for the doors to open, then it was a bit of a mad dash to get set up before the doors opened to the general public. It was a fantastic day, everyone from the organiser, other vendors and the public were just so lovely, it was a real pleasure to be able to vend there. Next year it is going to be a two day event, I'm already looking forward to it. After last year, when we didn't get our sheep clipped until the last day of July, I never for one moment thought that this year we would be even later, but we were a week later, the 6th August to be precise. I needed to get 30kg of fleece sorted and over to the Border Mill at Duns before the 14th August, so I started to sort through some only to find that an awful lot of the Hebridean fleeces had felted, and consequently could not be used for yarn production, so instead of having 30 or so fleeces to go through I had to sort through a lot more, which seemed to take me forever, however I managed and have delivered them. Well, here we are at the end of July, and again just as last year we are waiting for the weather to take up to allow us to get the sheep clipped, when the weather was good earlier in the month, the clippers were busy, now they are waiting for the weather to dry up to be able to come to us, unfortunately we don't have any buildings to put the sheep in to keep them dry. Whilst waiting for the weather to dry up I have been developing a couple of new accessories that use the Hawkshaw Sheep Cheviot tweed, all will be revealed in due course, when I have perfected them, the newsletter subscribers will be the first to find out. Contact me today for more information about the yarn this hill farm provides.